This document examines the Mayor of the District of Columbia's Fiscal Year (FY) 2013 budget and attempts identify bicycle-related programs and projects. (This document was created by DCBAC member Randall Myers and does not necessarily reflect the views of DCBAC). The Mayor released his FY13 proposed budget Friday, March 23, 2012. This budget describes in detail the programmatic goals and projected spending for the budget year that begins October 1 and lasts through September 30, 2013. The Mayor transmitted his budget to the D.C. Council March 23, who then makes changes to the budget to augment or limit agencies, programs or activities. The budget is then sent to Congress who approves the budget and then sends it to the President who enacts it. This document represents BAC's initial review of the budget. With regard to bicycling, the budget is not consolidated. The budget does not do a good job of specifying work that supports bicycling. The budget contains several programs and projects that contain the words bicycling but it only represents a small part. A conservative estimate suggests that the total budget is between $3.4 and $4.0 million for FY13. Most of this funding is supports the building of trails, pedestrian facilities, bicycling facilities, salaries, and certain operational costs. While we would like to 'breakout' or clearly state how much is spent on bicycling, the budget does not provide that level of detail. However, we will work with the District Department of Transportation to determine more precise amounts. The FY13 proposed budget is separated into six volumes and is generally divided into to funding categories - Operating and Capital. The FY13 proposed budget is $5.85 billion from Local funds and $11.28 billion in gross funds. The operating budget is supported by local source revenue (taxes, fees, etc.) and federal grants. This funding type typically lasts for a fiscal year and is used to cover operating costs like salaries, equipment and utilities. This funding category has several components or fund types with the Local fund being comprised almost exclusively of taxpayer dollars and the most active. The other major funding category is capital, which is derived primarily from bond proceeds or the borrowing of fund from banks and other lending institutions. These funds typically cover the costs of large or expensive projects that have useful life of great than 5 years like the building of bridges, streets and buildings. Specific bike or pedestrian related projects like Anacostica river trail are funded with capital dollars. Bicycle and Pedestrian Infrastructure. The capital budget proposes to spend $3.7 million from a mix of federal and local funds to improve bicycle and pedestrian facilities, including bike lanes, sharrows, bike parking, and Priority Corridors for pedestrians in each ward. This investment will continue the District’s momentum towards becoming one of the country’s premier multi-modal transit cities. According to BAC's initial review, a total of $3,422,422 was specifically noted as bicycle or pedestrian-specific. For most bike-related spending, the money is spent in capital projects. Due to the expense of these projects, spending for them occurs over several years. While Capital fund spending is mostly supported with borrowing, some funding is supported by federal grants and a gas tax - the highway trust fund. Bicycle Lanes/Signs - The scope of work includes improving pavement markings, street stripping, improving curb cuts for easy accessibility to bicycle paths, enhancing existing signs and installing new signs. Bike Parking Racks - This program provides authority to improve and construct safe bicycle facilities in the District. Bike Sharing (Capital Bikeshare) - Initially established in FY 2009, the scope of this project is to allow city residents and visitors to rent a bicycle at one of several unmanned, automated parking racks. Oxon Run Park Trail Improvements - Initially established in FY 2009, the project will construct and restore the pedestrian / biker trails throughout the District of Columbia. Rock Creek Trail Improvements - Initially established in FY 2006, the project will construct and restore the pedestrian / biker trails throughout the District of Columbia. Anacostia Riverwalk Trail - Initially established in FY 2004, the project redesigns and reconstructs the South Capitol St corridor, the freeway and neighborhood connections at Poplar Point; the transportation network in Historic Anacostia neighborhood; vehicular and bike / pedestrian access to the Southwest Waterfront; Traffic improvements to the Southeast Waterfront and the Southeast Federal Center; and the design and construction of bike paths along the river. Watts Branch Trail - The scope of work includes developing design plans and engineering specifications; cleaning and grubbing the trail of invasive weeds; re-paving sections that are cracked, add additional width to the trail; repair pedestrian bridges to correct safety hazards and improve accessibility as required under the Americans With Disabilities Act; furnish and erect security fencing to prevent trash dumping; furnish and erect directional signs and information waysides; and, furnish and install trail sides such as benches. Pedestrian Management Program - This program’s mission is to reduce mobile source emissions through the reduction in the number of vehicle miles traveled, improve vehicle inspection programs and support other transportation control measures. This project will help fund a Pedestrian Coordinator position that will work to enhance and improve the pedestrian experience in the city, and will work to educate residents and visitors about these improvements. An enhanced environment for pedestrians will lead more people to walk, and reduce congestion and emissions from vehicular modes of travel. Below are programs or projects that contain statements about bicycling facilities but do not clearly specify amounts spent. The budget is separated into Operating and Capital funds. 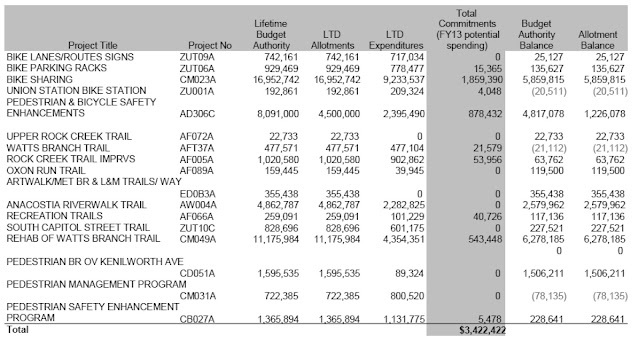 We've italicized the bicycle / trail words and added the paged numbers where information can be found in the budget. 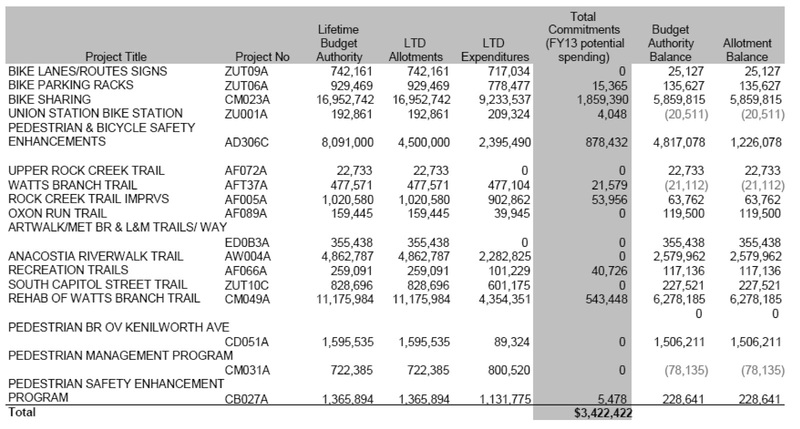 The District Department of Transportation (DDOT) chapter contains the bulk of the bicycling operating budget. As stated, the budget does not clearly articulate bicycle-specific services but contains funding for them. The Progressive Transportation Services Administration contains Bikeshare and other non-automotive transportation options. The Mass Transit activity manages the subsidy the District provides to WMATA and Capital Bikeshare. The budget for this activity is $5,128,000. Below is the bicycle-related key performance indicators or measures within this area. According to the measures, the agency projects a total of 20,570 Capital Bikeshare members in FY 2013. The current total number of annual Bikeshare members is 18,896 as of January 2012. A similar measure appears below in the Planning, Policy and Sustainability Administration. The Planning, Policy and Sustainability Administration establishes broad strategic goals to guide multi-modal program development, formulates the policies necessary to implement these goals, and ensures compliance with these goals and policies through plan review and permitting. This division's Planning activity develops vehicular and non-vehicular transportation projects and activities, including planning and designing bicycle and pedestrian transportation projects and initiatives. The total budget for this activity is approximately $3,625,000, an increase of about $278,000 from the prior year. Below is the bicycle-related key performance measures within this area. 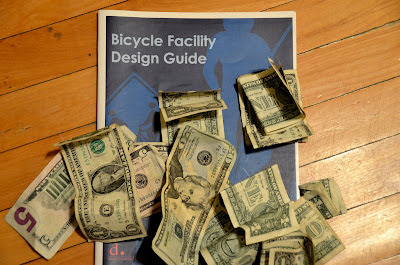 The Capital budget arguably contains the bulk of bicycle facilities spending. While having that spending identifying in specific projects would be optimal, bicycle-related spending can be found in several projects. Also, because capital funding occurs over several years, some projects may have began several years ago, making it difficult to find information about them. A portion of the Street Sign Improvements project (KA0-CE304) support major safety initiatives for pedestrian, bicycle, and vehicular traffic on District roads. Let us know if you have questions, suggestion or comments.